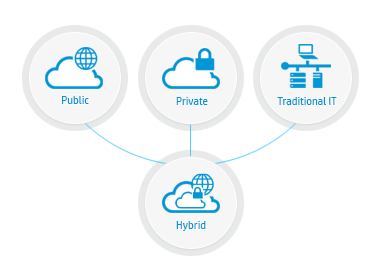 A hybrid cloud allows you to run different services in your private cloud, public cloud or on premise IT environments. For example, a scenario may be to host your email services on our enterprise cloud, or within Office 365, while maintaining other services, such as a specialist 3rd party application, on your on premise IT infrastructure. Our consultants can design the complete solution to ensure objects such as user accounts are synchronised across all environments therefore providing a seamless experience for your workforce. Historically we have found this deployment type to be particularly useful when you have some services provided by Microsoft Office 365 and/or Microsoft Azure. This is because there are limitations (both technical and financial) when hosting services within these environments. For example, business email is an application that is well suited to being hosted within the cloud. One of the cheapest ways to achieve this, assuming you don’t need a bespoke solution, is to utilise Office 365 however you cannot run a 3rd party application on Office 365. As such you could migrate your email to the cloud (Office 365) but leave other services, such as your applications, running on premise. Our consultants can then configure a hybrid cloud so that the solution is seamless to your staff. While our enterprise cloud can support hybrid configurations with your on premise environment it is not a common design as most businesses which to consolidate their complete IT infrastructure onto our cloud platform. However, we often create hybrid configurations between our enterprise cloud and the Microsoft public cloud offerings such as Office 365. One common approach is to utilise Office 365 for the licensing of the Microsoft Office application suite which is running on our cloud systems.